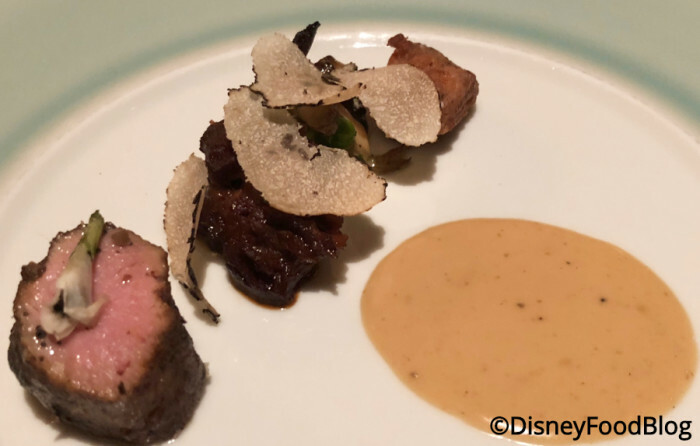 Victoria & Albert’s has three dining room experiences from which to choose: the Main Dining Room, the Queen Victoria Room, and the Chef’s Table. As I mentioned, on this visit, I dined in the Main Dining Room, which houses layers upon layers of tasteful Victorian style. Luxurious window and wall treatments, muted colors, and classic wood accents create a space that is comfortable, but formal. Place settings are meticulous, and tables are spaced to provide a bit of privacy. In the Queen Victoria Room, there are fewer tables, and thus the experience in this dining room is a bit more exclusive. Details even extend to the ceilings at Victoria & Albert’s, including this beautiful painted ceiling and intricate chandelier. 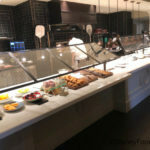 For the ultimate dining experience, guests can opt for the Chef’s Table, which brings a small group of diners into the kitchen, where they can speak to sous chefs throughout the meal and watch the action in the kitchen. No matter where you dine, place settings include these embellished Victoria & Albert’s plates. Something about that gold filigree style writing means you’re in for something special. The Menu at Victoria & Albert’s is extensive — but only one sheet of this menu is for the meal itself. Rather the bulk of it consists of various available drinks meant to be selected and enjoyed at different times throughout the meal. Believe it or not, there’s a Still Water Menu. This is worth a look for the sheer craziness of the whole idea. You’ll find the “House Water” toward the bottom. That’s included with the meal. 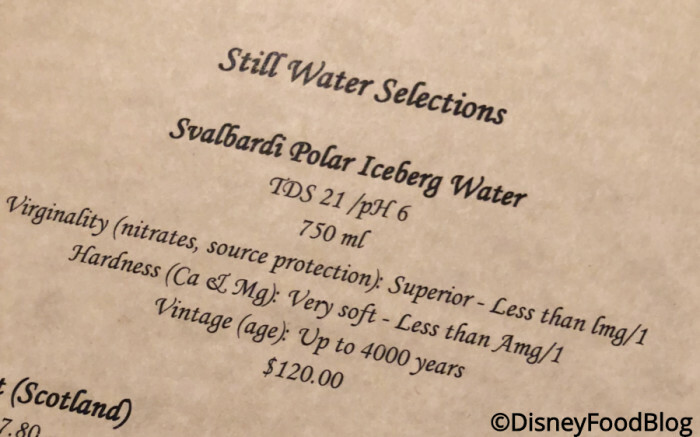 I did, however, order the $9 Danish water, just to see if it was something special. Spoiler alert — it tasted like water. 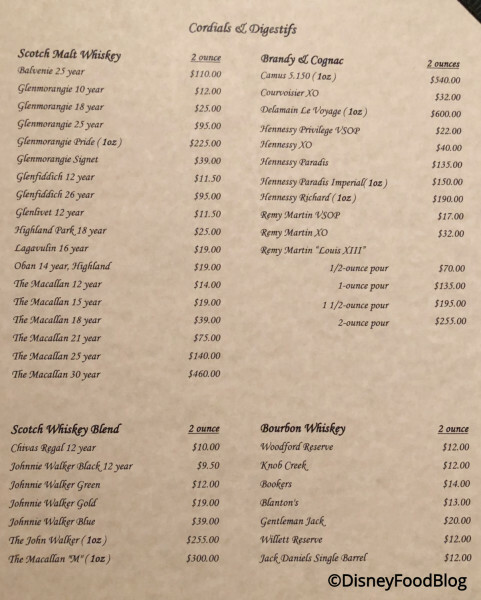 There’s also an extensive Single Malt & Blended Scotch Menu, with prices ranging from $11.50 to $460.00 per two-ounce pour. Toward the end of the meal, diners might prefer to peruse the Tea Selections menu. Varieties include Oolong, Black, Green, and White with a range of flavors and scents. There are also Cordials & Digestifs for every palate and price point. Please note: the menu experience was altered somewhat after my most recent visit. Previously (as on my visit), guests were able to choose from either a seven or ten course tasting menu. However, the experience has just changed to the Chef Degustation Tasting Menu. 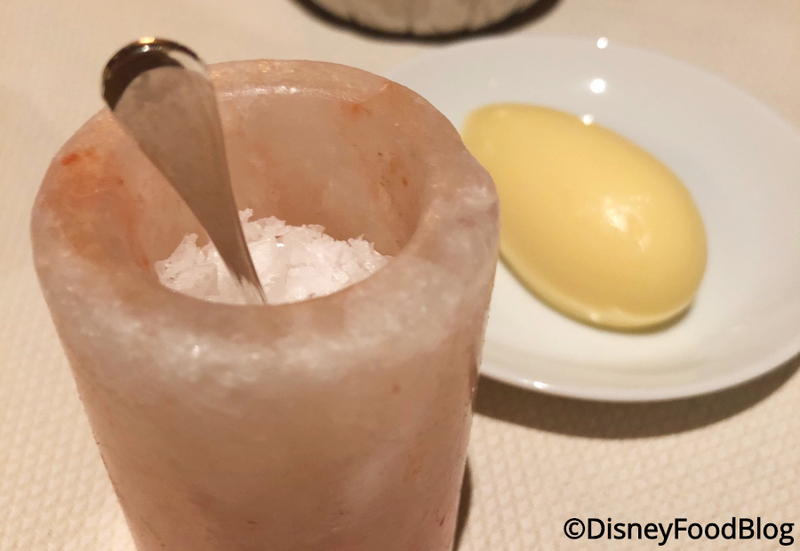 The difference is that guests will enjoy anywhere from eight to twelve courses, with the amount of courses varying based on the portion size of some of the dishes. The current price is set at $235 per guest plus tax and gratuity. 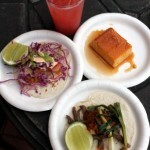 Wine pairing is also an option for an additional $150.00 per guest. I had chosen the Chef’s 10 Course Tasting Menu. 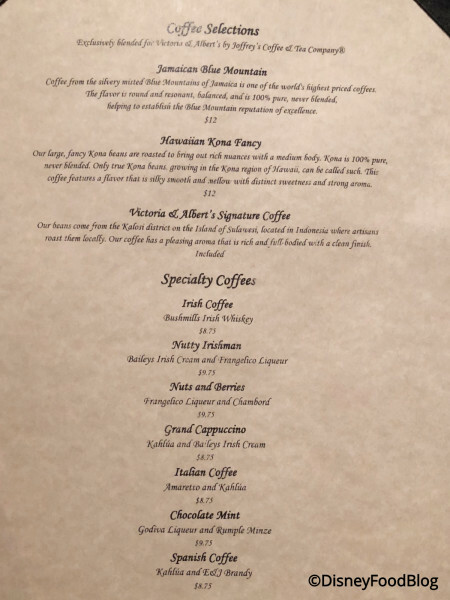 The menu comes personalized with your name and the date on which you dine, making this a worthwhile souvenir of this once-in-a-lifetime experience. 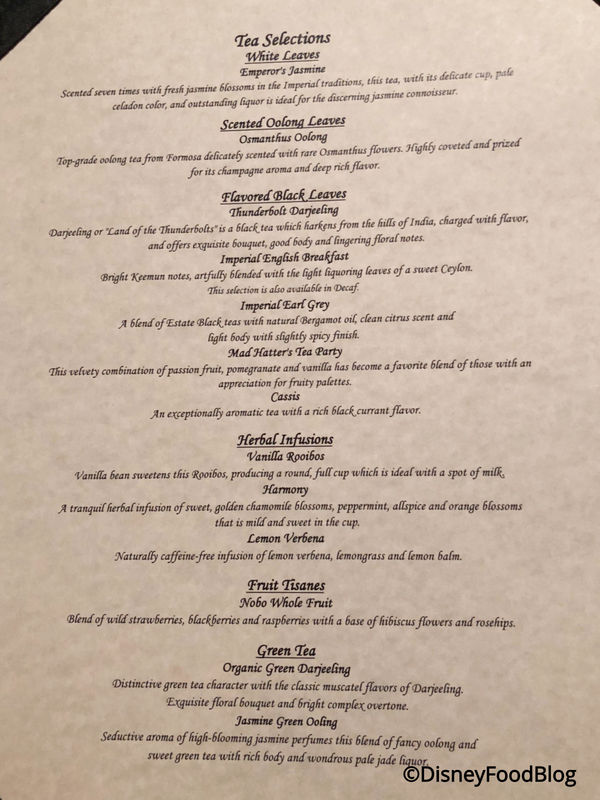 It also includes a brief description of each course as it has been designed. To be honest, this personal touch is something I really love. For the price of the meal, it’s expected that each course will be thoughtful and expertly crafted. But the attention to each diner’s preferences shows a desire to please that, honestly, you don’t find in every high-end restaurant. My dining companion and I began our meal with cocktails. 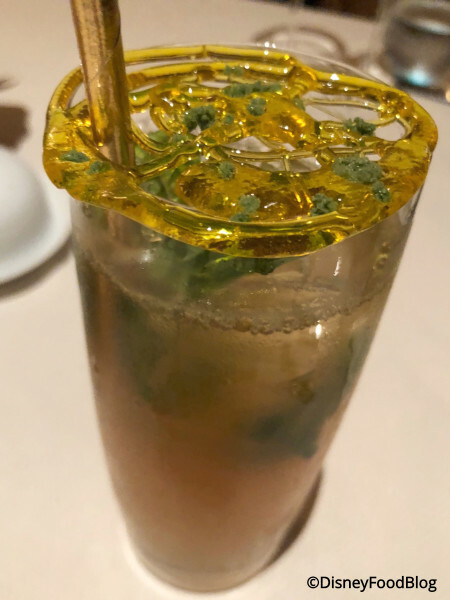 The Mint Pineapple Julep was delicious, with lots of muddled mint and a cover of swirled, hardened sugar. This was refreshing and light — a good way to begin a long, rich meal. 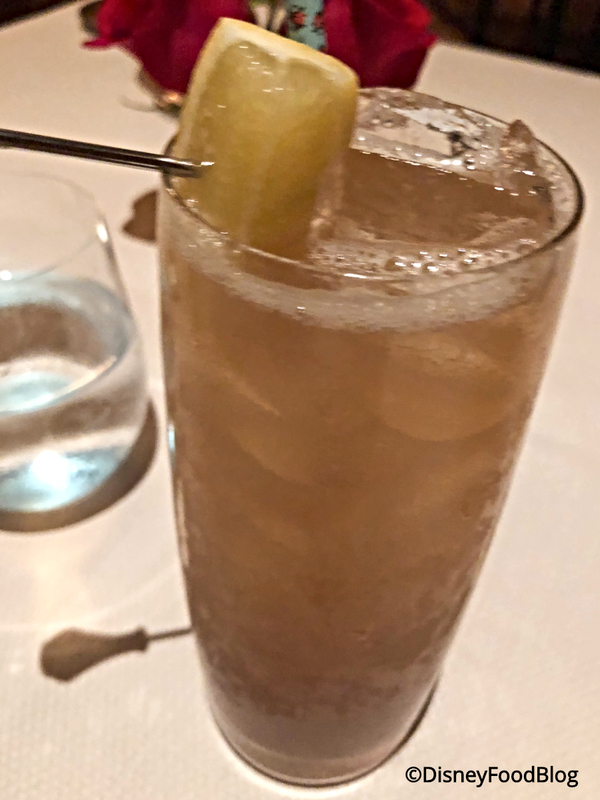 The Ultimate Long Island Ice Tea is likewise light and refreshing, with a large wedge of lemon and a splash of Coca Cola. Bread is brought to the table, warm and fresh from the oven. It’s accompanied by Himalayan salt and a quenelle of soft butter. You don’t want to fill up on bread, but this is a delicious and homey way to start the meal. My meal began with an Amuse-Bouche (translating to mouth amusement, basically). It’s a small, single bite of food meant to excite the palate. My Amuse was Delta Asparagus with Champagne and Buttermilk. 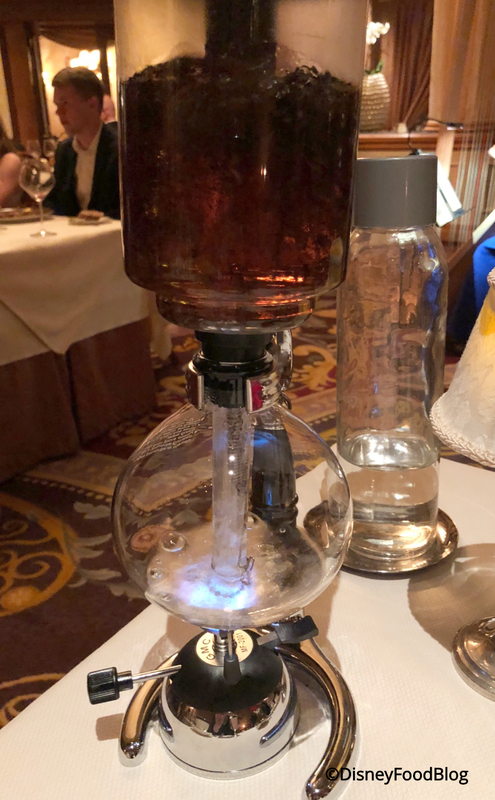 The innovation was intriguing and delicious. 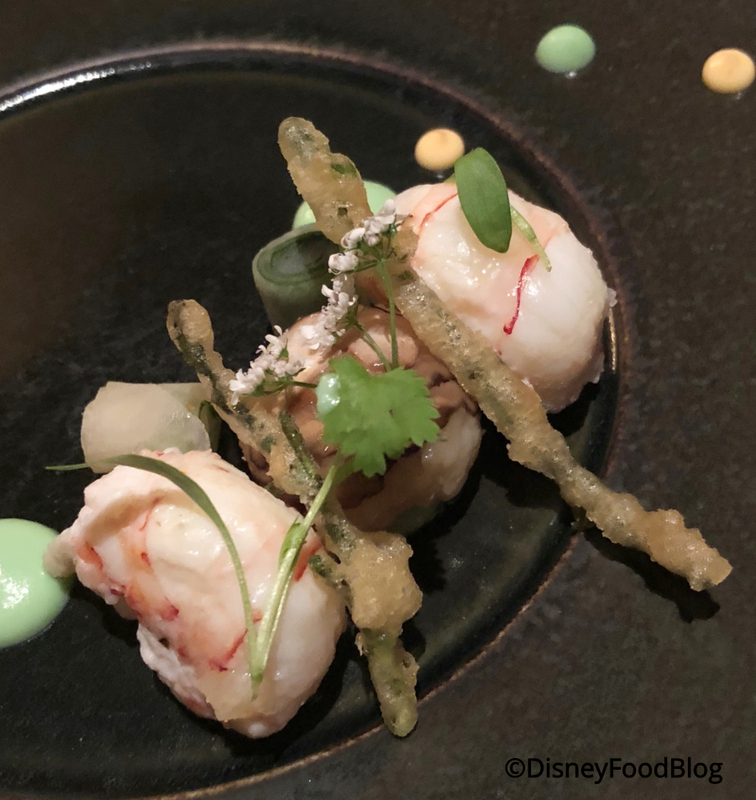 My next course was New Zealand Langoustine with Pickled Daikon (radish) and Avocado. The langoustine — which are like incredibly supple, large prawns — were arranged well to create just a couple of nice-sized bites. But just a heads’ up: this comes to the table cold, which I was not expecting. I like shrimp, but I’ve never been a fan of cold shrimp or shrimp cocktail, so this wasn’t my favorite dish. My third course was Gulf Shrimp with Poppy Seed and Lemon Ravioli, and it was very good. 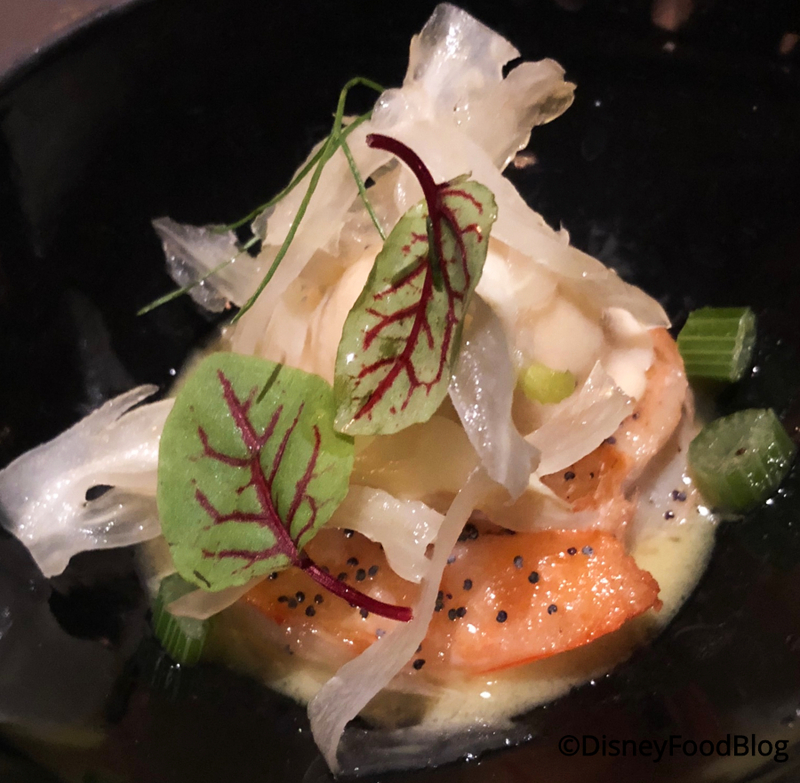 The shrimp with the soft ravioli was a surprisingly great combination, and the lightly cooked celery placed around the plate lent the dish some welcome crunch. 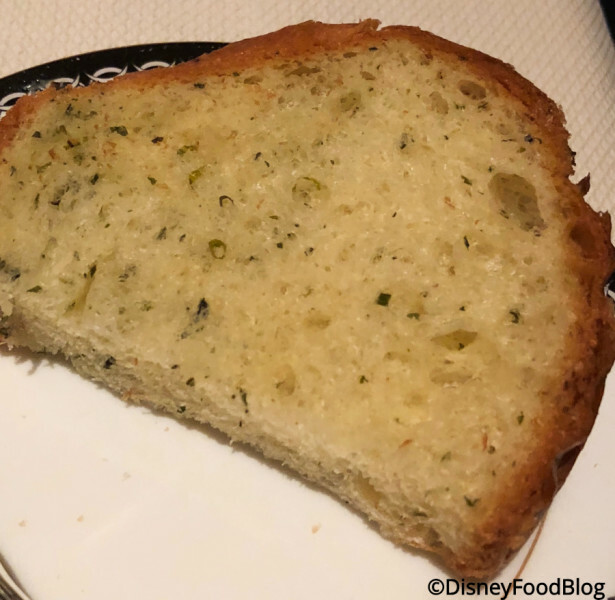 Between the third and fourth courses, my server brought around an herbed bread with a crazy-cool presentation of butter. This second service of bread is timed to cleanse the palate before diving into some of the richer dishes of the evening. Ball of butter atop a sculpted mountain, anyone? It was beautiful, and the bread was delicious. For the fourth course, my dining companion received Wild Turbot with Toasted Capers and Preserved Lemon. It was perfectly cooked and well-balanced, with acid coming both from the capers and the lemon. We also received Dover Sole with Spanish Chorizo Bouillabaisse. This was really fun, from the roulette of Dover sole to the stewed tomatoes and perfectly cooked shrimp. The sauce was complex and delicious. Next up we got away from the sea and had Marcho Farms Veal with Fava Beans and Summer Truffles. This was a dish full of surprises and complimentary flavors. The summer truffles were phenomenal with the meat. The Rohan Duck with Lavendar and Glazed Florida Peaches was a good combination. The peaches were sweet and paired surprisingly well with the duck. The lavender was (thankfully) subtle. I loved the little crisp on top of the duck. 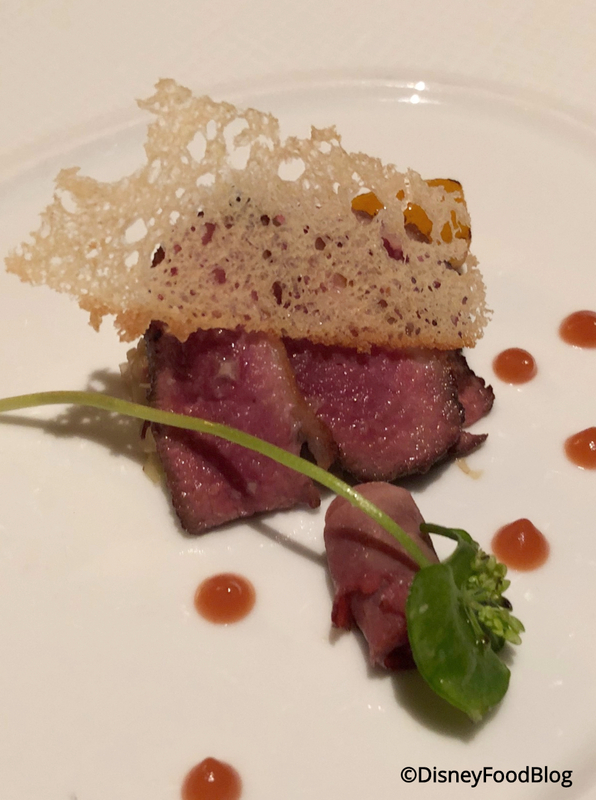 The penultimate course was beef, and it was my favorite of the meal. The dish is Australian Kobe-Style Beef with Potato Pinwheel and Ramps. There’s an option to add a spectacular piece of Miyazaki Japanese Beef, and you know I had to have that. 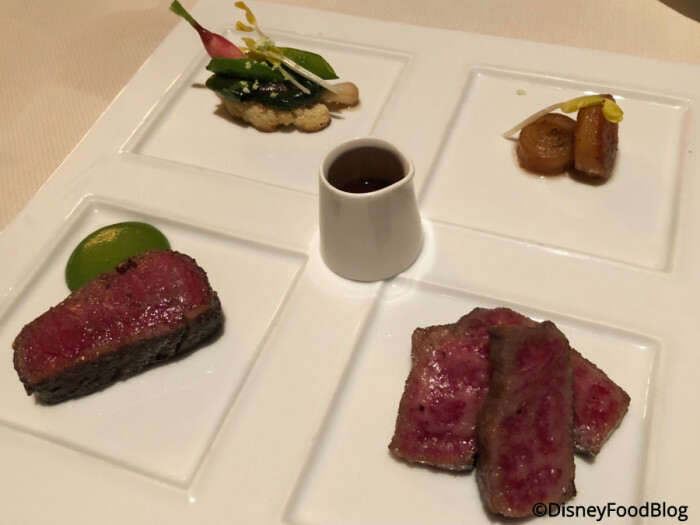 Miyazaki Japanese Beef is top-grade Wagyu raised and classified in Japan, and there is no finer bite of beef on the planet. Everything on this plate was just awesome. 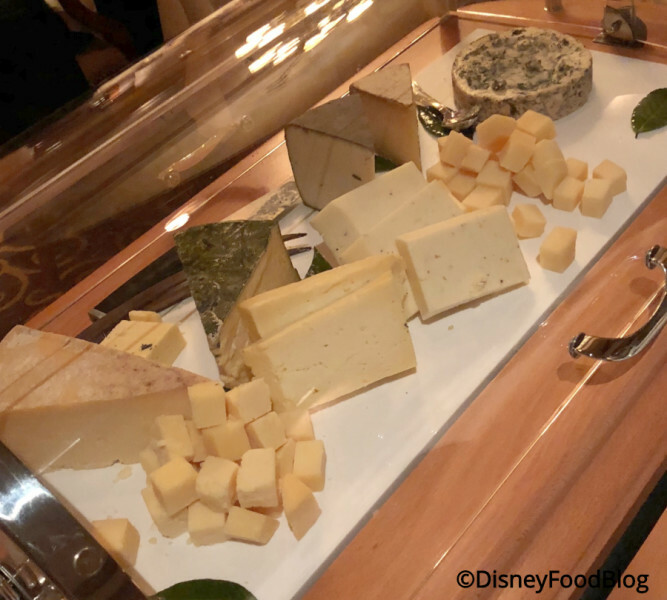 And then there was cheese — a Selection of Cheese From the Market. 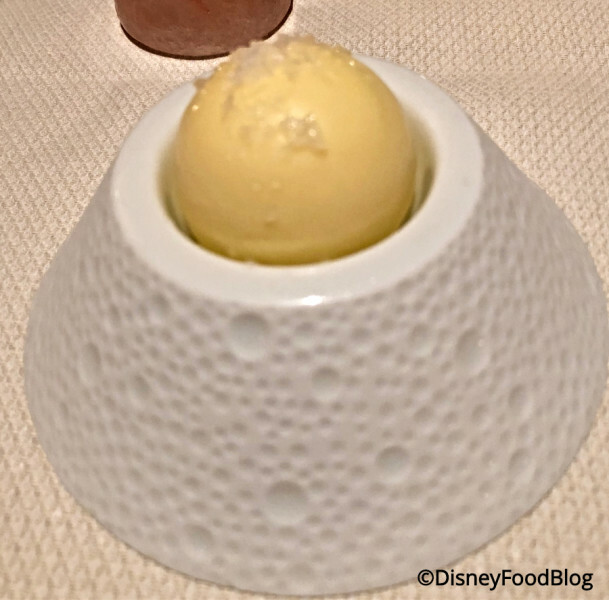 This was a great way to transition from the savory courses to the desserts. 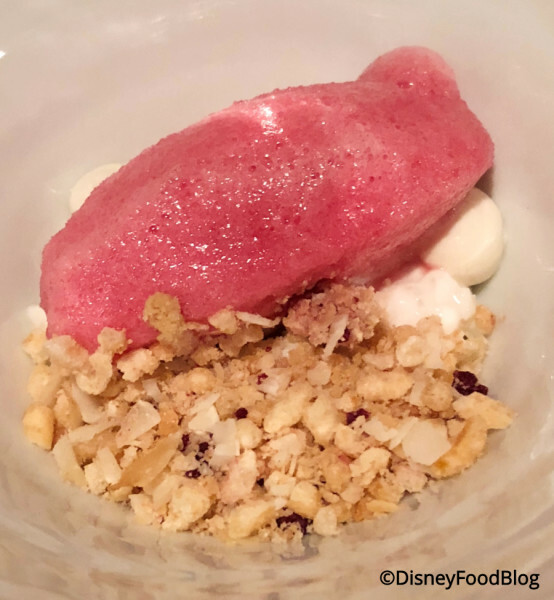 For the final dessert courses, my dining companion had a quenelle of Berry Sorbet with crispy bits. This was super refreshing. For the dessert courses (yup, there were two! 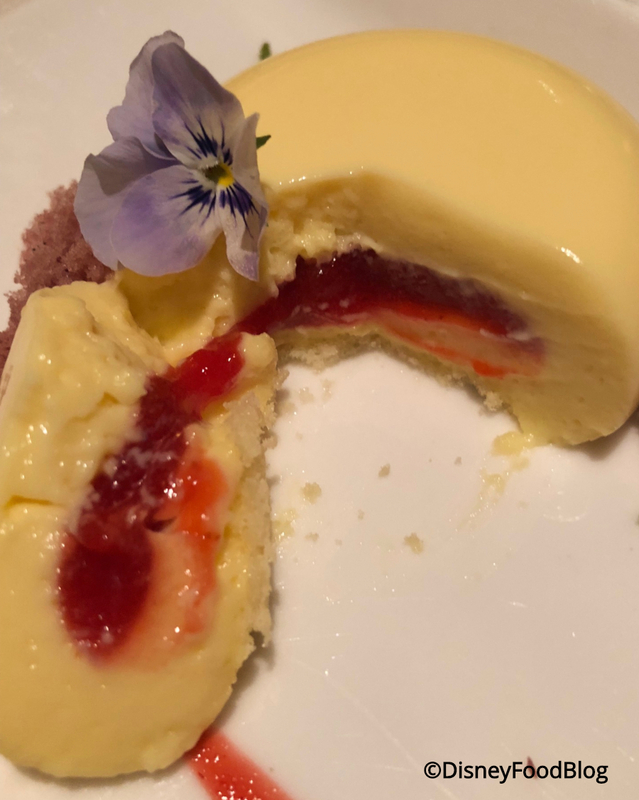 ), I was served this ab.so.lute.ly awesome Lemon-Strawberry Cremeux. The circle of rich, creamy lemon pudding was flawless. The strawberry compote was hidden inside (and carried throughout the garnishes, save for that simple, sweet violet). I can’t say enough about this dessert. 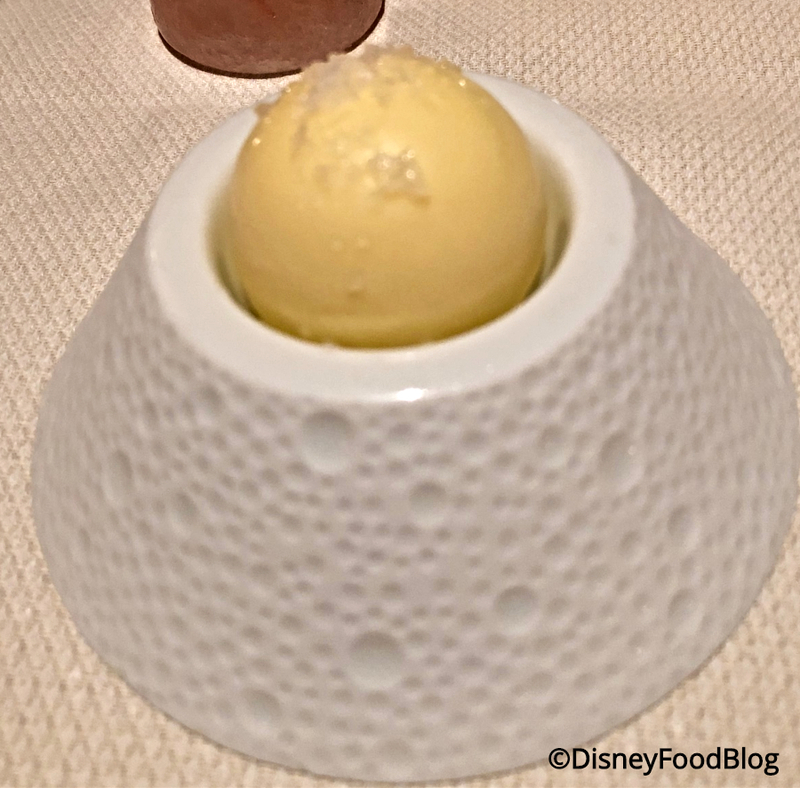 The texture of the cremeux was smooth and full of lemon flavor, and it was divine with the accompaniments. 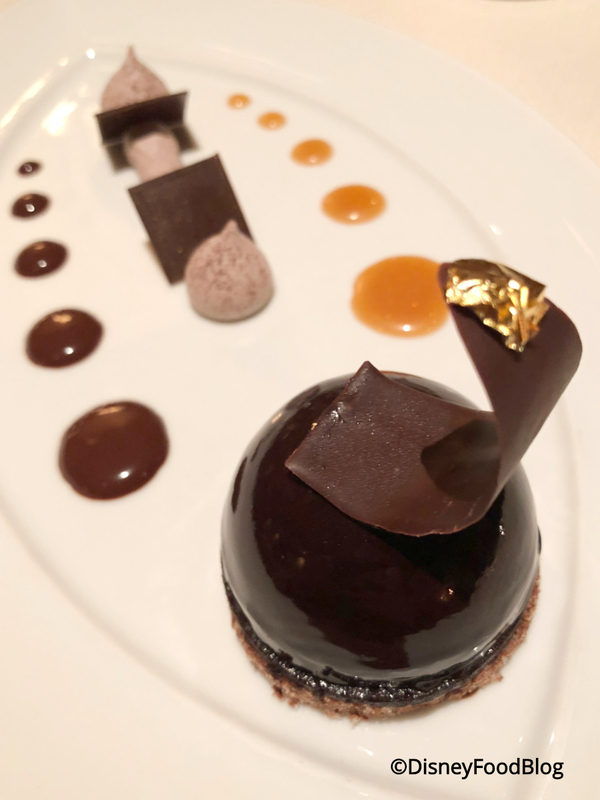 The next dessert, a Bittersweet Chocolate Dome on Praline Crunch, was rich and playfully plated. Each component was well-executed, and combining those components kept the dish from becoming one-note. Plus there’s a bit of edible gold on there. So pretty. And with that, our ten courses were complete — but the delicious bites weren’t over. 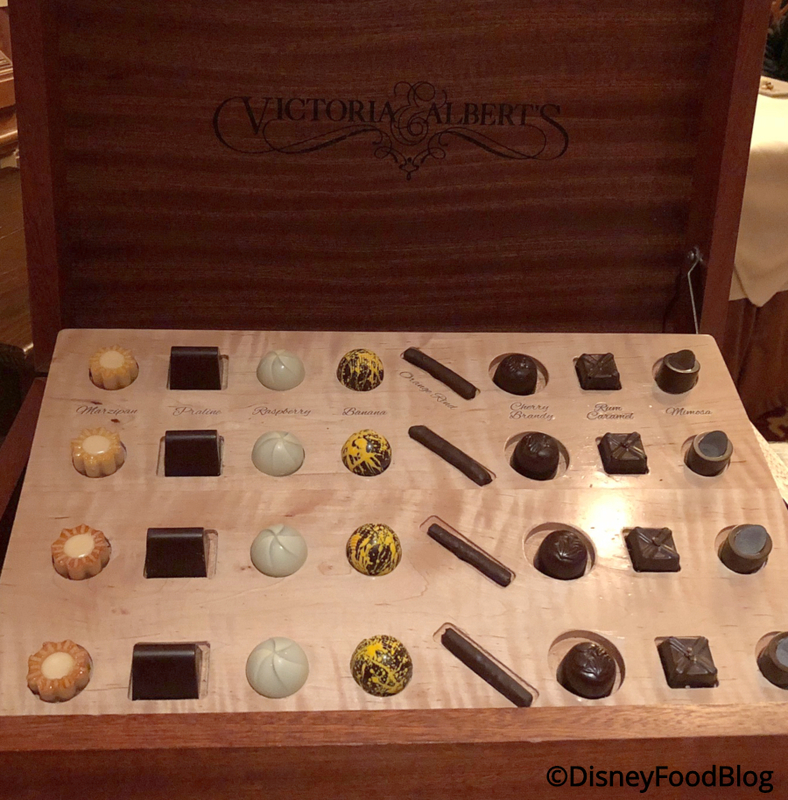 Victoria & Albert’s provided White Glove Chocolate Truffle Service, and they did not skimp on the sweets, which were packaged so I could take them with me. I left with a delicious box of exquisitely crafted truffles. The final piece: I was given a rose at the end of the meal. A nice touch. You want to have a SUPER High-End dining experience while on vacation. You appreciate fine dining and want to try one of the most highly rated restaurants in the country. You and your significant other want a quiet, adult night out. You are vacationing with the kiddos and don’t want to find a sitter for the night. You balk at spending hundreds of dollars on a single meal. You don’t care for “fancy” food. There is no dining experience quite like Victoria & Albert’s in the World or, really, in the world. 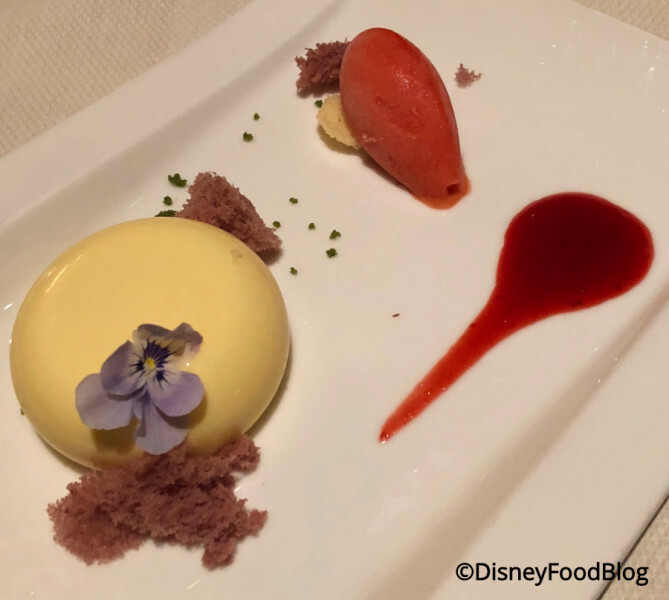 You’re a monorail ride away from the Magic Kingdom, and yet you are cloistered away into an elegant space and receiving world-renowned service and celebrated cuisine. 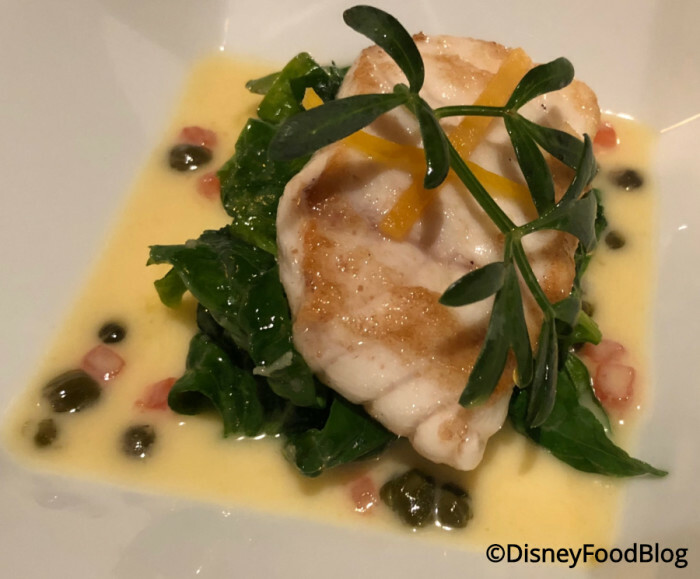 Every meal is a unique dining experience — so even if you choose to splurge on Victoria & Albert’s more than once in your Disney travel lifetime, it’ll be a new experience every time. Now, let’s answer those questions from the beginning: Is it worth the month? Personally, I think it is worth the money. The experience and quality is unmatched. 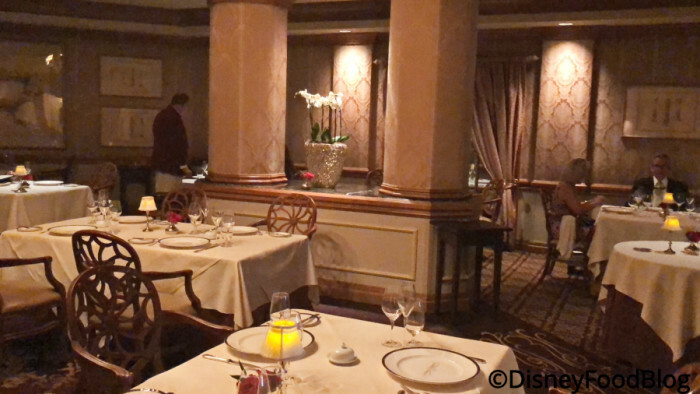 However, compared to my experience in the Main Dining Room, I would absolutely recommend the Chef’s Table. While the meal is terrific anywhere you dine, there’s something special — and a bit more relaxed — at the Chef’s Table, and a meal there is a grand culinary adventure. I’m not a fan of SUPER fancy dining, and in the kitchen, things are lot less formal. 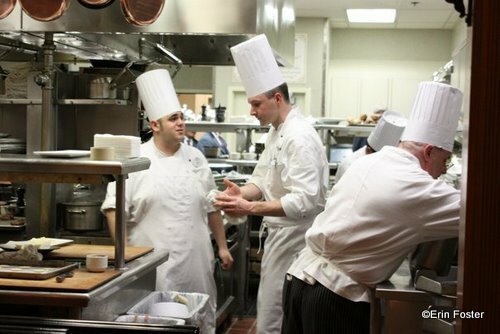 Plus, you get the opportunity to ask the chefs what they’re working on, what they enjoy about working there, how the kitchen “works,” etc — which is so much fun as far as I’m concerned! It’s worth the added cost for this opportunity. 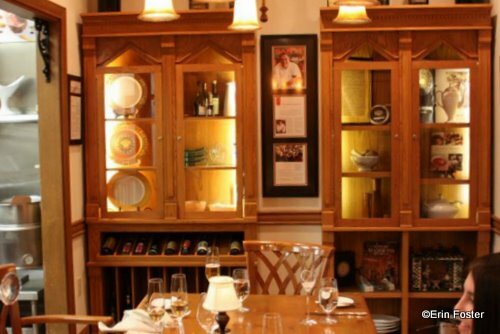 But no matter where you dine with Victoria and Albert, expect to have the meal of a lifetime. 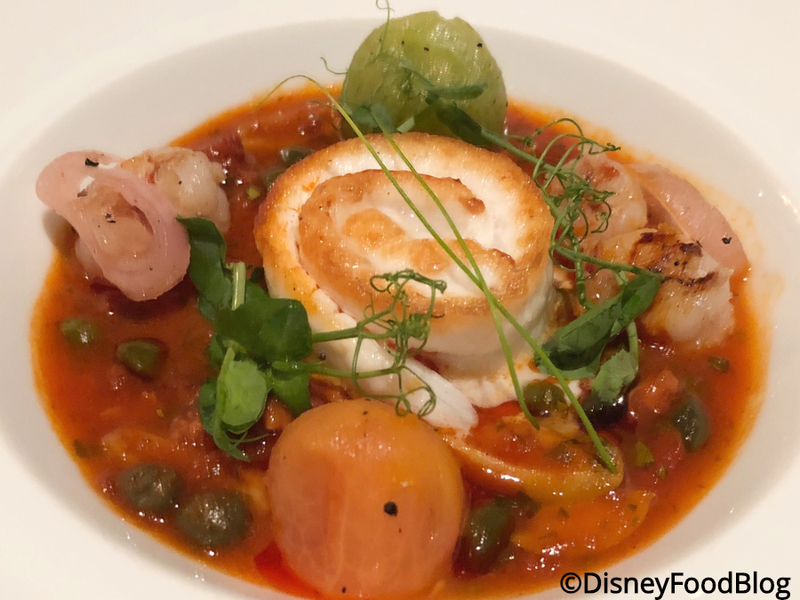 See where Victoria and Albert’s Falls in our rankings of signature restaurants in Disney World here! 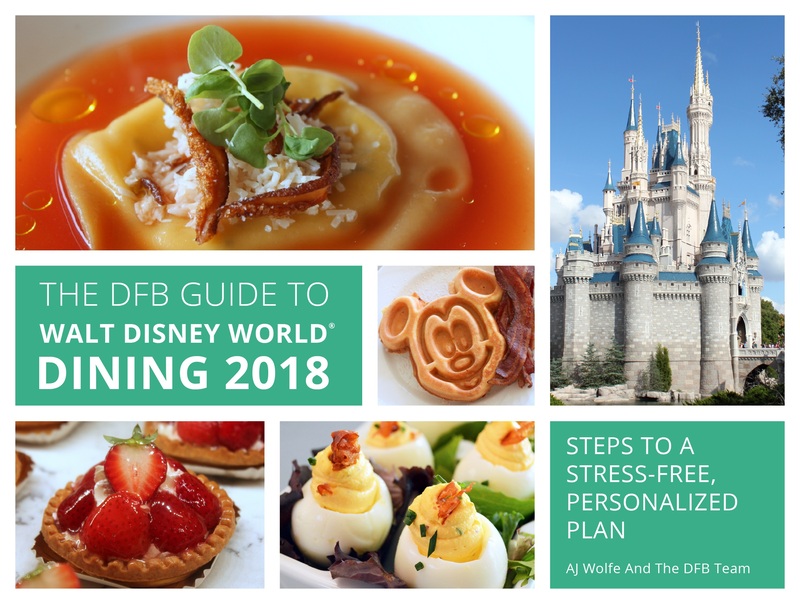 And get great tips on date nights, specialty dining, and more in our DFB Guide to WDW Dining e-Book! 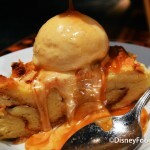 « DFB Video: 7 Perfect Food Days in Walt Disney World! We’ve eaten at hundreds of restaurants in the Michelin guide. We did V&A a few years ago for one of those milestone birthdays. Food was excellent, but we’ve had better. Found the service a bit over bearing. Still the most we ever spent on one meal. Would not do it again, but once was fun. My wife and I will be celebrating our 20th wedding anniversary at V&A in late September, while there at Disney for our annual F&W festival visit (Adults only!). 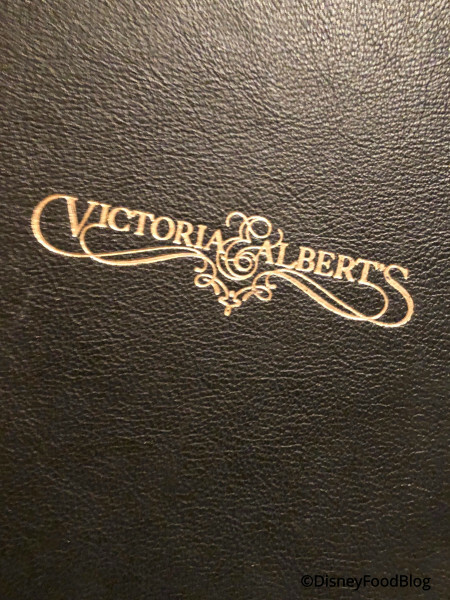 After reading this review I am very much looking forward to the food and dining experience that Victoria and Albert’s has to offer. 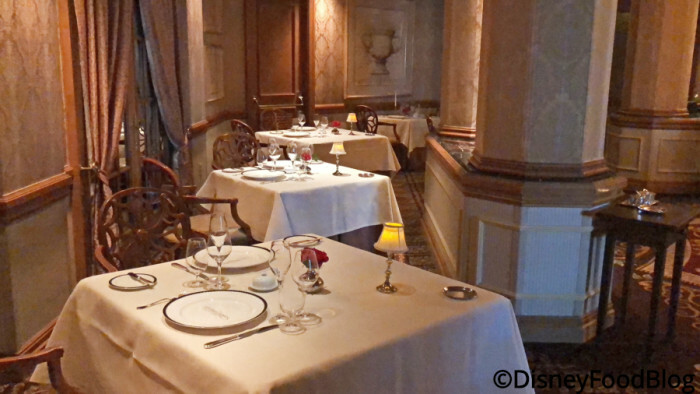 Question: When do we have the opportunity to select a specific room to dine in? I’m leaning towards the Chefs table.. Do we choose from the menus before we arrive? 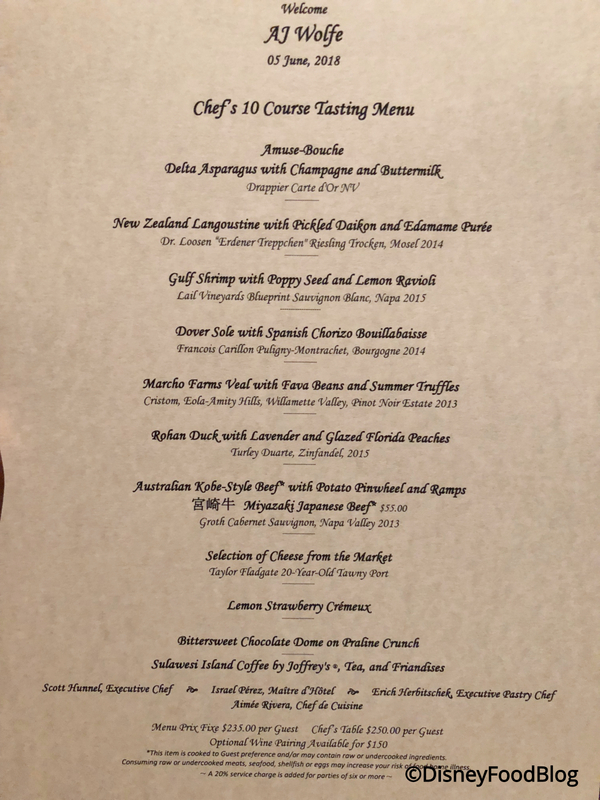 Not sure how all this works.. We’ve never eaten at a place quite as exclusive and top rated.. Well, maybe if you count LeCellier!! 🙂 Thanks! Absolutely love V&A’s. 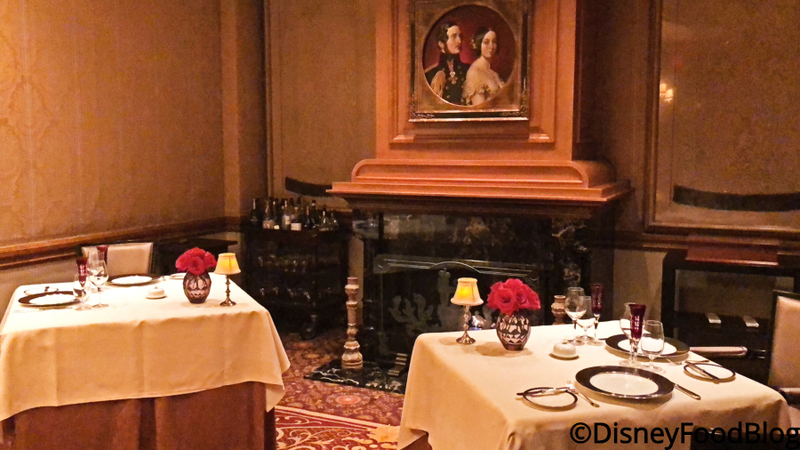 Have been twice: Queen Victoria room and the Chef’s Table. 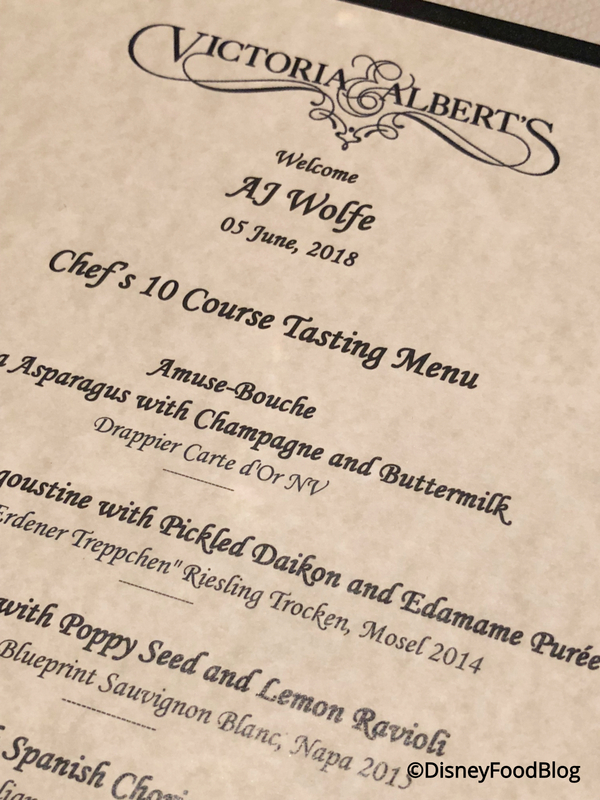 Chef’s Table is on the docket again in October and I cannot wait. I’d heard grumbling of coming menu changes regarding the 7-course option. Do you happen to have more details other than what was mentioned in the article as far as the portion vs course number? 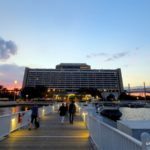 Mike K: You will want to call Disney Dining Reservations as soon as possible to book a spot at V&A as you are well within the 180-day reservation window. In the past, the menus at the Chef’s Table were slightly different than those in the Queen Victoria Room and Main Dining Room. 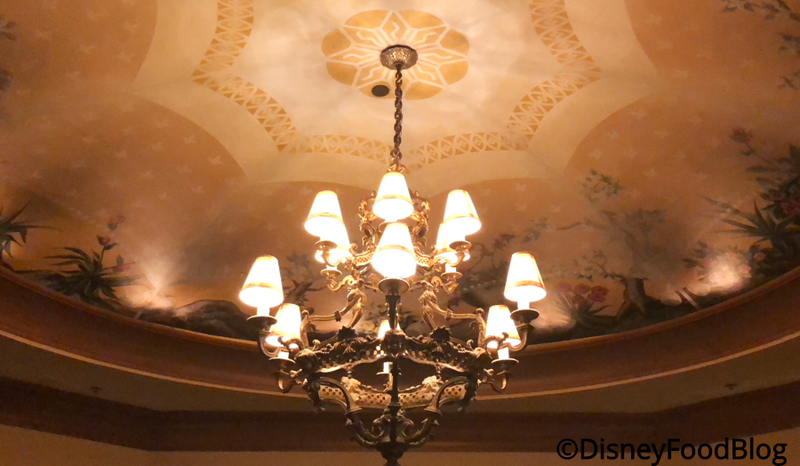 Further, the Queen Victoria Room always featured a 10-course menu whereas the Main Dining Room featured a 7 or 10-course menu. Today however all three dining areas receive the ‘Chef Degustation Menu’ which is a variable 8-14 course menu depending on the night. It seems to me that today, the only difference between the Chef’s Table, Queen Victoria Room, and Main Dining room is the atmosphere of the space in which you dine. We love V&A and have dined there many times. Chef’s Table is a hard reservation to get. Usually books quickly 180 days out. You can put your name on a wait list in case someone cancels, but in nearly 4 years since moving here, we’ve only been called once😊 Dining rooms are just lovely and you get to enjoy the harpist, which you would not hear at the Chef’s Table in the kitchen. We did the Chef’s Table for our 25th wedding anniversary in 2005. Chef Scott was still there. It was the most memorable dining experience of our lives. Our dining room, kitchen and breakfast room in our home is filled with the pictures of that meal. My husband is a photographer and the pictures are stunning. We had them professionally framed they are( 17×24”). Our menus were framed as well. Each time I look at them I am reminded of that magical evening. Is the Truffle service included? Do they accept Tables in Wonderland? And can you prepay so hubby doesn’t know how much it costs? I would love to do this for our Anniversary but he won’t enjoy it if he knows how expensive and might have a heart attack! LOL! Demaris, the truffle service is complimentary! Tables in Wonderland is no longer accepted at V&A’s, unfortunately. While prepayment is not required, you could call the restaurant to see if it’s an option. If not, you might discuss with your server a discreet way to settle the bill. This is a real French Cuisine restaurant, with an excellent service, a great wine selection and a taste second to none. With that upfront, this is not a place for those with a faint wallet. Our dinner celebration including the tip rounded $1100.- for the two of us. Was it worth it, I think it was, at least for one time. You need to experience this kind of food and service to be able to compare. 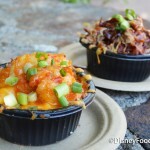 I love those people calling themselves Disney foodies, but all they eat is the park food, but very few, for not saying none of them has had the opportunity to eat here. We have dine here a couple of times and so far the food was excellent, the combination of flavor was great, which remains me of Ratatouille, when explaining the combination of flavors will make you fly. Haute Cuisine is always expensive, takes time and a lot of consideration. And as I say I do not eat there every day, so once a year is not that bad. Wine selection at during our dinner was not the most impressive, but then again, it was not the worst either. 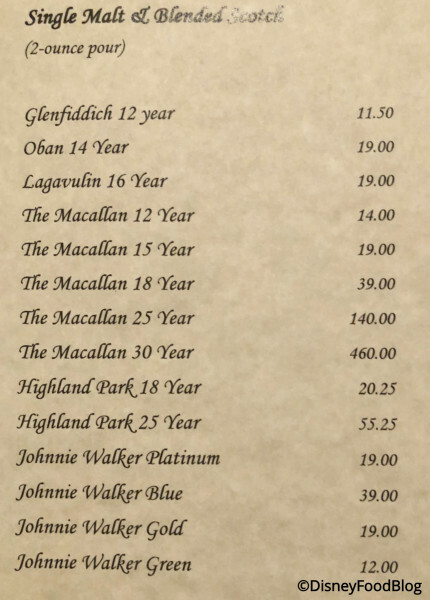 The wine list is impressive. Our servers were excellent but not intrusive, which is always a must. 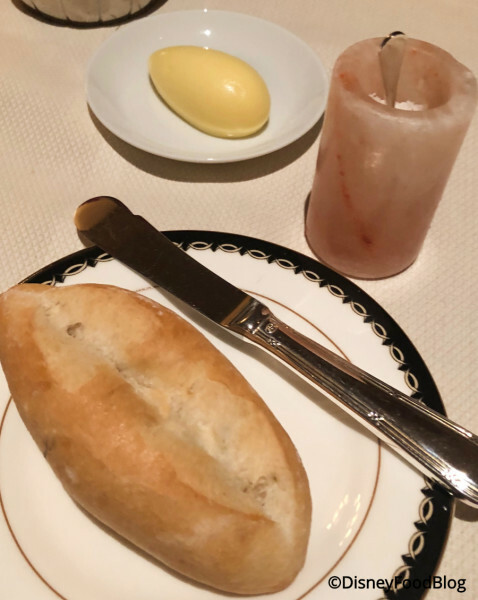 The bread and the butter was something unique, which also enhance your dinner experience. I have read some comments from people complaining about the service as well about the price. 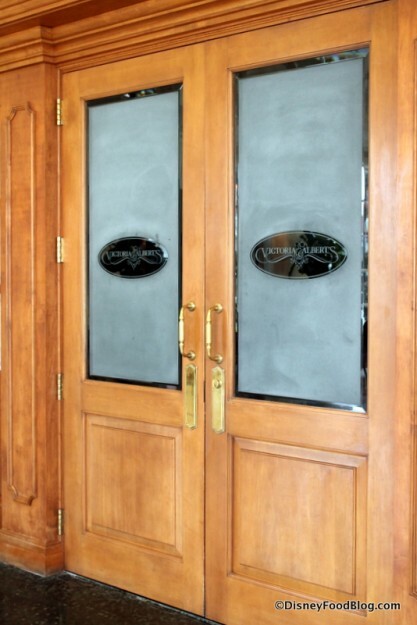 We have a local restaurant here in Pittsburgh, that is very close to V&A and there used to be one just like that, but the original owners decided to go back to France and they closed the place and no one has been able to fill those shoes. We dined at V&A on February 8 for the first time, me, my wife, and our daughter and son in law, it was the most incredible dining experience of our lives. The food was fabulous, the service was impeccable, the entire evening was absolutely special. 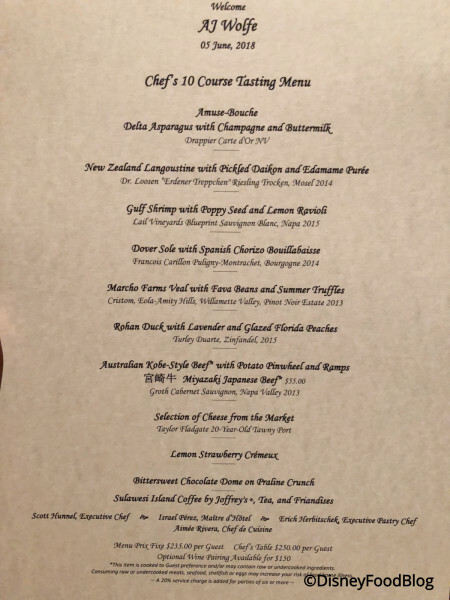 Expensive, of course, worth it, absolutely, it’s certainly not going to be a regular reservation reservation, but we’re hoping to get the chefs tabe next year. Having it explained to you doesn’t even come close, it has to be experienced to be appreciated. We have not dined at V &a since 1999, while the food was good, the service was overbearing. 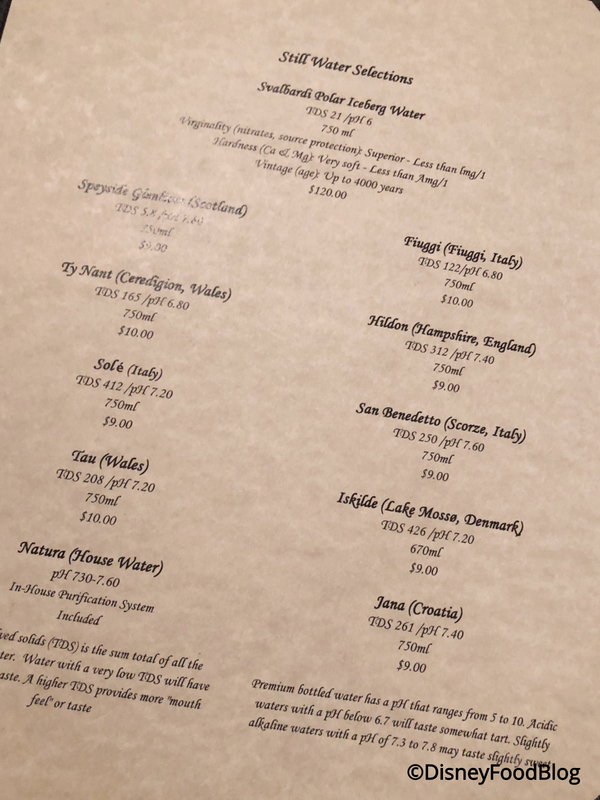 We felt that we were inferior because we choose the American wine flight, instead of the french. We have gone back to Disney several times since then, and have not felt a need or want to go to V & A again. We’ve done Victoria & Albert ten times — and have seen a few variations now in the menu, and we remember when all the staff names were either “Victoria” or “Albert.” We haven’t eaten at the Chef’s Table, and I don’t know that we every will. 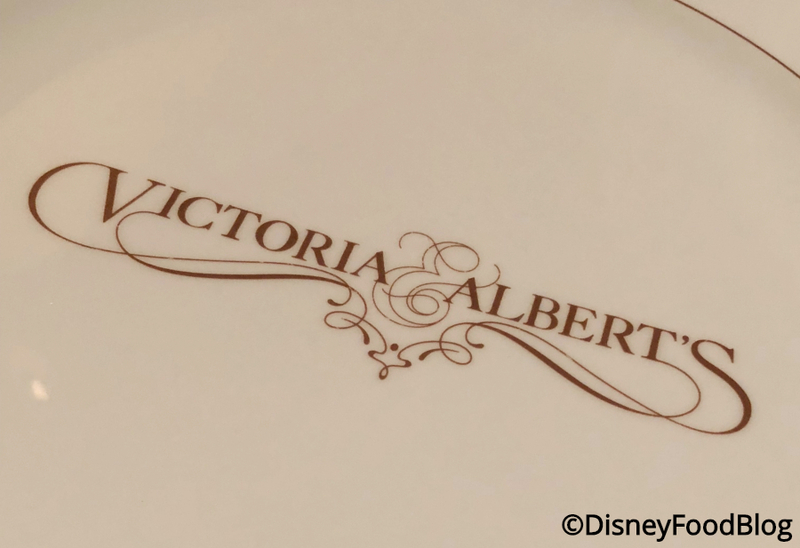 Years ago Disney made a boo-boo and had Victoria & Albert on the dining plan (before it was called that) and, you betcha, we certainly grabbed a table during that vacation. We’ve even purchased our Kona coffee maker from V&A and use it most Thanksgivings. Finally, to save a few bucks on wine, we’ll bring two or three bottles of premium wine from home (always fun to pack that!). Can’t wait to try out this new menu design!